From mid-July until the final days of the 1889 season, the National League pennant race was a fierce, two-team battle, with the Boston Beaneaters, led by workhorse pitcher John Clarkson and team captain Mike “King” Kelly, trying to unseat the defending champion New York Giants from their throne. At the end of play on September 26, with little more than a week left in the season, the two teams were deadlocked with identical 78–42 records. Over the next three days, Boston won two of three, while New York won one and tied two. The two teams were both 37 games over .500, but the Giants held first place with a winning percentage of .653 (79–42), barely ahead of the Beaneaters’ .650 (80–43). As the teams headed into the October home stretch, the final five days of the season would be decisive. And New York stumbled right out of the gate, losing to Pittsburgh, while Boston beat Cleveland. The Beaneaters were back in command, 81–43 versus 79–43. The 1889 National League pennant was theirs for the taking. But then came October 2, 1889, the decisive day of the race. New York was playing Pittsburgh for the last time, while Boston was wrapping up its series in Cleveland. The Giants won their game, beating the Allegheny team, 6–3. For Boston, though, a huge drama was about to unfold, one that would ultimately cost it the pennant of 1889. Pitching for Cleveland was Ed Beatin, a 23-yearold who had shut out the Beaneaters on consecutive days back in mid-September. He would be going up against the fantastic but overworked Clarkson, making his 70th start of the season for Boston. 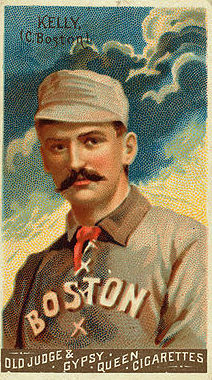 Clarkson, who had already logged nearly 600 innings pitched en route to an incredible 49–19 record, had started the Beaneaters’ previous six games and 11 of their previous 12. 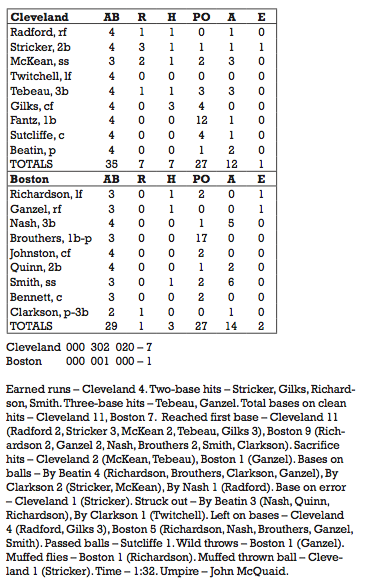 As for the game itself, Cleveland added a couple more runs in the top of the eighth to put the game away for good. With the loss, Boston again fell behind New York by mere percentage points, .650 (80–43) to .648 (81–44). But it was a deficit from which the Beaneaters would never recover, as the Giants won their final three games to clinch their second consecutive National League pennant. 1. Boston Herald, October 3, 1889. 2. Boston Journal, October 3, 1889. 3. New York Times, October 3, 1889. 4. Boston Herald, October 3, 1889. 5. Worcester Daily Spy, October 3, 1889. 6. Boston Herald, October 3, 1889. 7. New York Times, October 3, 1889. 8. Worcester Daily Spy, October 3, 1889.